As Kyle and Liisa and I drove up through the Trossachs from Stirling, we took the A84 with a planned stop at the The Trossachs Woolen Mill at Kilmahog, near Callander. We all made good use of the woolen mill shop, but the main reason for our visit was Hamish. 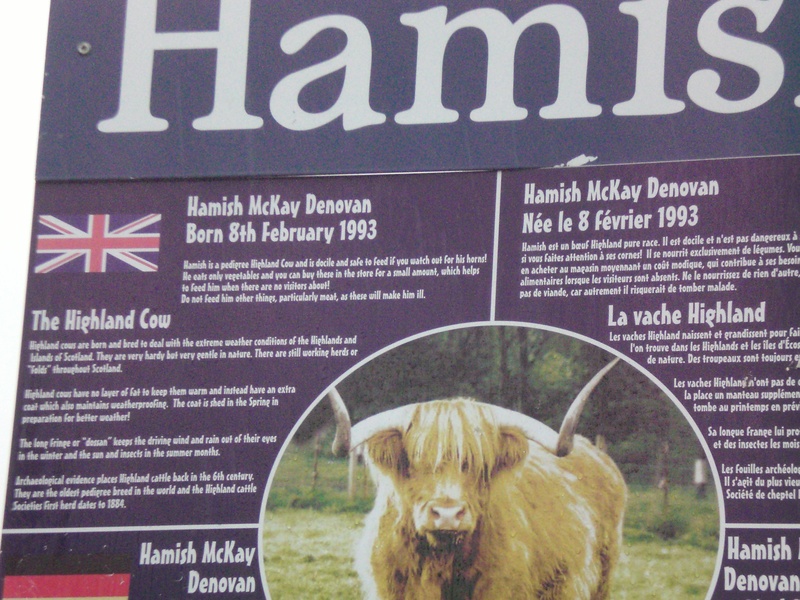 Hamish McKay Denovan aka Hamish, the Highland Coo was a tourist’s delight. I swear that as we approached, he actually mugged for the camera. Hamish had been greeting visitors at the Woollen Mill for nearly twenty years. In 1996, Hamish was part of an exhibit promoting the work of animal artist Joseph Denovan Adam (1841-1896); after the exhibit, Hamish, was doomed to be slaughtered. The “Save Hamish” campaign was a great success, and Hamish found his home at the Mill. He was there to greet the thousands of visitors who stopped at the Mill on their way through the Trossachs. Hamish continued to pose for many artists, one dubbed him the Kate Moss of the Highland Coo world because he looked so good, even on bad hair days. Next fall, when I am in Scotland again, I shall go up to the Mill and meet Hamish Dubh, a black Highland Bull who is now Hamish’s successor. Hamish Dubh lives with his companion, Honey, and they both were schooled in posing for the camera by the grand master. This entry was posted in Ancestry, Eco-travel, Ecology, Land trust, Scotland, Scottish ancestry, Self drive Scotland tours, Travel, Uncategorized, Women Writers and tagged Hamish the Highland Coo. Bookmark the permalink.